Organised by the Birmingham Trades Union Council. Privatisation of our health service will reduce staff, service levels, cost us more for treatments, Concerned? Following on from the successful TUC protest rally in Manchester in September, this important conference is open to all trade unionists and the public to see what we can ALL do to campaign against this threat to our NHS. 11am – 4:30pm, Saturday, 22nd of February 2014. Priory meeting rooms, Bull Street, City centre, B4 6AF. Please put Saturday 22nd February 2014 in your diary for the Birmingham Trades Union Council conference on the NHS Reforms, their impact and what we can do about them. We have secured some national and local speakers from Keep Our NHS Public, Save Our NHS and hospital campaign groups/the Pensioners Convention, etc with further speakers to be booked in the coming months. The day will also feature practical workshops on responding to and fighting privatisation from campaigners, local and national. The event will be held at the Priory Rooms, Bull St, Birmingham from 11am to 4pm with refreshments. There will be no charge for this event, but we hope to have some sponsorship and also donations on the day from conference participants. Further details and a draft programme will be available before Christmas. 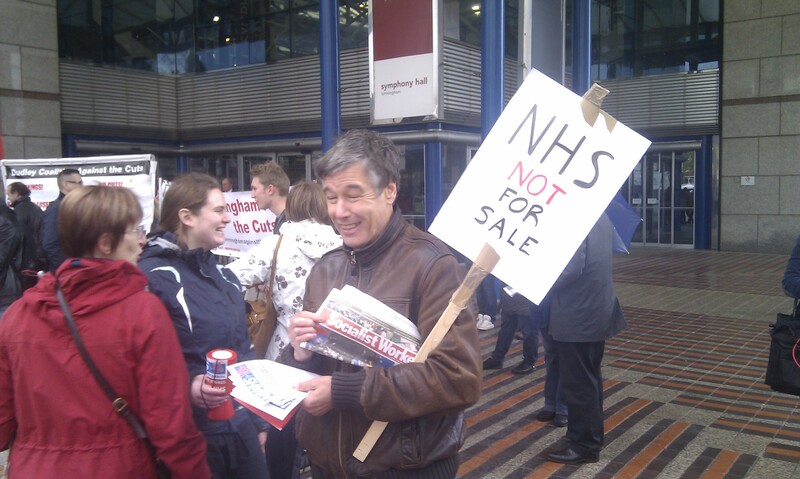 Birmingham people will have to get organised for a major fight to keep the NHS alive in the West Midlands. A major NHS funding crisis has been deliberately engineered by the Conservative / Lib-Dem Coalition government, and this is going to erupt between now and 2015. Can you imagine an NHS run like a train company with preferred business users; 1st and 2nd Class services; ever-rising ‘fares’; delays; disruption and paid-for extras? lt is now possible. 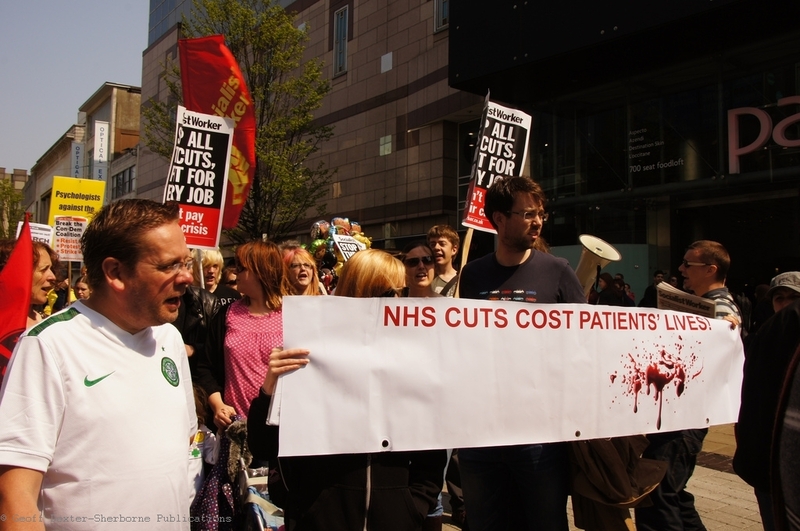 Birmingham Against the Cuts extends messages of solidarity to two sets of striking workers today – doctors (GPs and hospital doctors) are on strike over cuts to pensions, and at the University of Birmingham, support staff are on strike over pay cuts. Doctors are facing the same pension cuts as other public sector workers – pay more and work longer to get less. This attack serves two purposes – it allows them to cut pay, without having to say they are cutting pay and it softens the NHS (and other public services) up for privatisation. The money saved will not go into the pension pots, despite the language the government uses about how pensions are unsustainable and we have to work longer, but will go to paying off the deficit caused by the bankers. Hospitals will still have skeleton staff to deal with emergencies – in fact there will be more doctors on duty today then there were over the Jubilee weekend or on a normal nightshift. Doctors and other NHS workers do not go on strike lightly, nor would they do so if they thought they were endangering patient’s health. This is the first doctors strike for 37 years. Being a doctor is a difficult job, because medical research advances so quickly, with new techniques and medicines being developed all the time, and thousands of medical trials conducted every year. This is a particular issue for GPs who need to keep a shallow but general knowledge of all areas of medicine. As we get older, we find it harder to incorporate new ideas and practices into our lives, and get used to the ways we have done things. Making doctors work later to get their pensions could have serious knock on effects on patient care. Meanwhile, at the University of Birmingham, support staff are on a two-day strike, over a derisory pay offer, which has seen just 77 of over 2,000 staff offered a £250 / 1.9% pay rise, whilst removing shift allowances for evening and weekend work which leaves many people facing a pay cut. Even those who will get a rise will see their wages fall in real terms as inflation which has fallen below 3% for the first time in a few years. This comes in the context of the university increasing its surplus from £22.3m to £27m per year, and is in a healthy financial position, despite cuts to teaching budgets from central government funds which are being used as cover for reducing the living standards of some of the lowest paid staff at the university, whilst the Vice-Chancellor, David Eastwood enjoys huge pay rises and a salary of over £400,000. 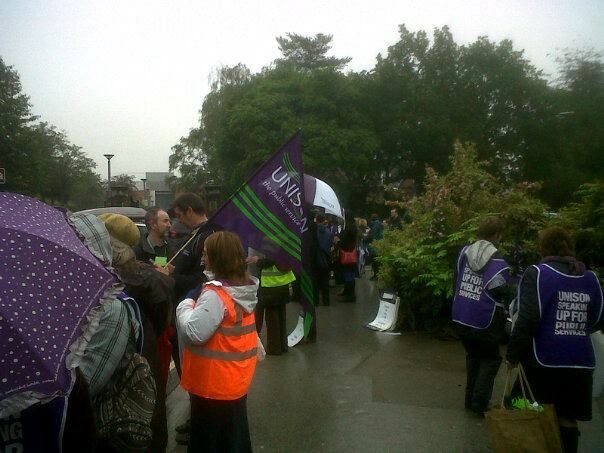 You can support the University strikers by signing this petition. Both these groups are taking action today against the government austerity program which threatens to send many more people below the breadline, with real wages being reduced further, the continuing threat of workfare and the abuse of apprenticeships to undercut minimum wage legislation. We extend our solidarity to those workers on strike today, and encourage all other workers who are facing cuts to pay or conditions to push their union to take strike action. Thousands of staff are facing the prospect of losing their jobs and wards are closing. Now the hospital is making moves to deliver healthcare on the cheap, by using people on work experience to help with patient care. Patients and staff will rightly be very worried about the standard of patient care as this scheme is rolled out. When we signed up to the Boycott Workfare campaign, we did so on the basis that we believed that workfare would be used to cover for cuts, with people on benefits being forced to do unpaid work in order to keep the money they need for food, fuel and rent. People who refuse to take part in workfare schemes face benefit sanctions of up to 6 months, although pressure on the government from campaigners and legal challenges has seen sanctions removed from some of the schemes. With unemployment remaining at high levels, no sign of economic recovery and a continued commitment to austerity from the ConDem coalition, we can expect to see more of this, unless we make such a huge outcry now that it is not politically viable for public sector organisations to continue to take part in workfare schemes. Today the Telegraph has reported that the £5bn work programme is failing, as employers are reluctant to expand their workforce in the face of economic uncertainty. The Telegraph reports that only 20% of people sent on the Work Programme find work, and there is no data as to whether these jobs are temporary or permanent. One thing is clear, that the work programme does not improve people’s chances of getting a job, and is an expensive waste of taxpayer’s money. The issue with the NHS is not just about the exploitation of unemployed and disabled people, or about the fact that this is taking the place of paid positions, it is also about threats patient care and cuts to the NHS. We implore everyone who can to come along on Thursday and say No to Workfare and No to NHS Cuts. Sandwell Hospital, West Bromwich, B71 4HJ. Assemble at the corner of Little Lane and All Saints Road, outside the A&E dept. 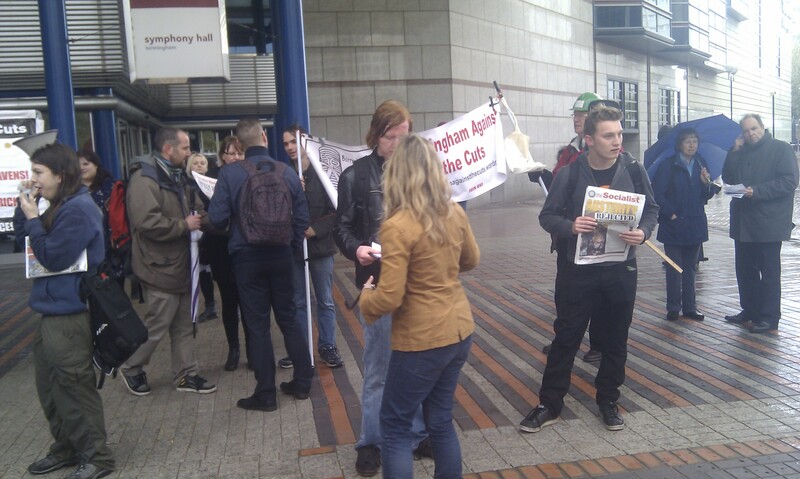 Around 60 people gathered at the ICC in Birmingham on Tuesday 15th May, as Lansley was expected at a NICE conference being held at the ICC. The demonstration was called by Save Our NHS West Midlands and Keep Our NHS Public, the demonstration attracted wide support from other organisations, NHS workers and everyone else who uses the NHS. Save our NHS West Midlands and the Birmingham Mail both reported on the event, which took place under the cover of the entrance to the ICC at centenary square as we sheltered from the rain (having missed the hail storm thankfully). At one point police asked demonstrators to move out from underneath the cover, a request that was roundly refused on the basis that we didn’t want to get caught out by the weather! You can watch some videos of the protest by Birmingham Citizen TV. 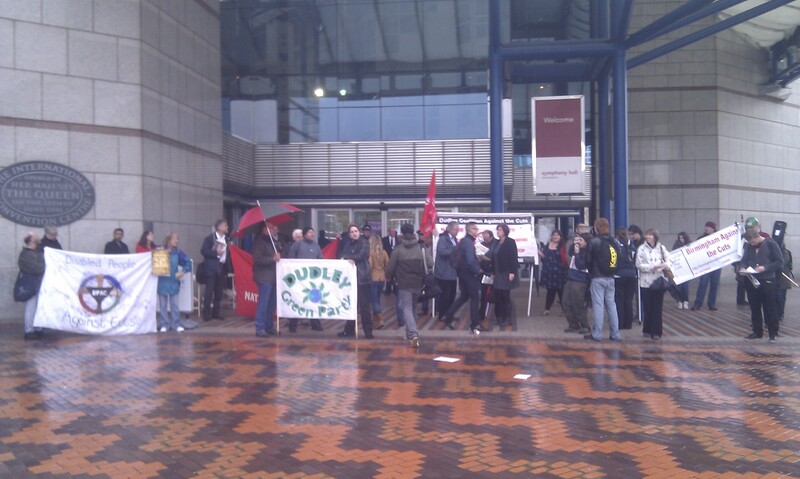 Of course, Lansley didn’t pay us a visit on his way in to the conference. Still hurting from the heckling he received at the RCN conference on Monday, and perhaps mindful of this incident, Lansley decided not to take the opportunity to try to defend the fragmentation and privatisation of the Health Service his NHS bill is bringing, nor to explain why he is seeking 20% efficiency savings in the most efficient health service in the world, how staffing cuts have led to the use of workfare labour in Birmingham hospitals, or why he supports regional pay, which 99.2% of Nurses voted to oppose. He and the rest of the coalition will find it increasingly difficult to avoid the backlash to their disliked and harmful reforms as patient care suffers like it has at this Birmingham Dialysis unit. Perhaps it is because this will not be an isolated incident that Lansley has vetoed releasing the risk register, a decision the Information Commissioner says “is unjustified and departs from policy” and may have far reaching implications for freedom of information in the UK.